Parchment · 28 leaves · at earliest 779 CE · Lyon ? 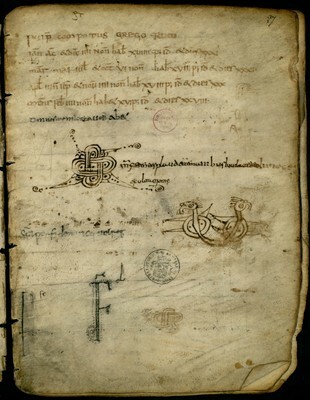 Lyon's City Library and Paris' National Library share parts of a manuscript whose opening piece is an Easter calendar for 779-797, which suggests the manuscript was written in 779 or immediately before. The Baluze fragment was a witness in André Wilmart's 1933 edition of the Transitus beatae Mariae. Lyon's fragment was identified by Célestin Charlier in 1957; it contains the beginning of the text which continues on Baluze 270 f. 1r. Lyon's fragment had been linked with Paris lat. 5288's fragment by Elias Avery Lowe a few years before, on material and palaeographical ground; there is no textual continuity between the Lyon + Baluze quaternions on one side, and lat. 5288 ternions on the other side. The rapprochement of these parts was suggested by E.A. Lowe, CLA VI, 785. See also CLA V, 561, and Bischoff, KFH II, 2853a, on IXth century annotations.